Gilmore Girls star Milo Ventimiglia has told fans he doesn’t want a second revival for the series. Gilmore Girls, the comedy-drama series about the relationship between a young mum Lorelai (Lauren Graham) and her daughter Rory (Alexis Bledel), aired for seven seasons from 2000-2007. Last year, the series returned for four more feature-length episodes courtesy of Netflix but left Rory’s story on a cliffhanger – leaving fans desperate for more. Ventimiglia was speaking at London’s Heroes and Villains Convention during a panel for Gotham, in which he played Jason Lennon (aka The Ogre) for three episodes in 2015. When asked about whether he would like to do another revival, Ventimiglia said: “When you go to a concert, right, the band leave the stage and you clap and they come back on for one more song. They leave again and you clap more and you want them back on… I don’t know if that’s how it works. Ventimiglia played Rory’s love interest Jess Mariano through the main series, and returned to the mini-series revival to support his former flame during a difficult period of her life. Doctor Who star Alex Kingston has confirmed she will be appearing in the upcoming Gilmore Girls revival for Netflix. Speaking at a panel at Florida Supercon, Kingston confirmed she was part of the cast and would appear in more than one of the revival’s four planned episodes. She said: “I play a very eccentric character in a couple of those episodes. Kingston is best known for her role as River Song, the daughter of Amy and Rory and the Doctor’s time-travelling wife, on Doctor Who. She recently appeared in the Christmas 2015 special as the Doctor arrived to sort out problems with her other marriage. The eagerly-awaited Gilmore Girls reunion is expected to arrive on Netflix later this year after filming for the new series, titled ‘Gilmore Girls: A Year in the Life‘ completed in mid-May. There will be four episodes, which will each be 90 minutes long and named for a season of the year. The majority of the main cast, including Lauren Graham and Alexis Bledel, are scheduled to appear. Gilmore Girls: A Year in the Life is expected to be available on Netflix later this year. It’s the news that we gals at TV Guide have been waiting on for a looong time. And now it’s here, straight from the mouth of Lauren Graham herself! From July 1st, all 7 seasons of Gilmore Girls will be available to stream on Netflix around the world in all countries and territories where Netflix is available. The catchup library comes in advance of the new Gilmore Girls reboot series, entitled Gilmore Girls: A Year in the Life, which will debut exclusively on Netflix later this year (rumours are saying November). Until then, watch Lauren Graham’s Gilmore Girls Global announcement below! Last Friday we received the news we thought we’d only ever hear in our dreams: our old favourite show Gilmore Girls was due to return. It wasn’t just the cast reuniting for a brief skit on an American chat show either, Netflix will making a whole new series starring our favourite television mother-daughter combo Lorelai and Rory once again. Dreams really do come true. 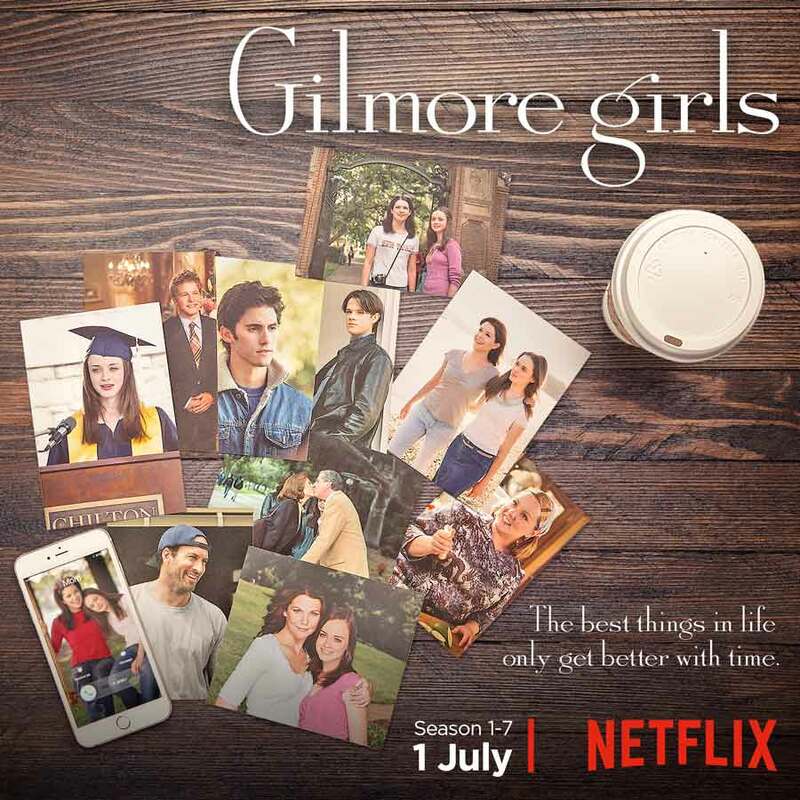 Lauren Graham, Alexis Bledel, Scott Patterson and Kelly Bishop signed are all signed up to return as Lorelai, Rory, Luke and Emily in a new four-part Netflix series titled Gilmore Girls: Seasons. Original series creator Amy Sherman-Palladino and executive producer producer Daniel Palladino will write and direct all episodes, which will be 90 minutes each and feature a different season of the same year. The series is set in the present day, eight years after the series conclusion. We’re buzzing about the news, as Gilmore Girls is one of the few series returning we’re genuinely pleased to see make a return. Here are five other shows we’ll wait forever to grace our screens again. I’ll just put it here so it’s out of the way. The world wants a Friends reunion to the point that if one former star appears in the same place as another star, journalists are overcome with questions about a “reunion”. Ross, Rachel, Monica, Chandler, Phoebe and Joey received a pretty fitting ending as Monica and Chandler moved to the suburbs, Ross and Rachel got back together, Phoebe married and Joey got some new birds (before moving to Los Angeles, if you choose to believe the Joey canon). Do we really want to tamper with that? Yes, please. Will and Grace’s charming depiction of the former couple turned best friends Will and Grace as they navigated life in New York City was sitcom gold. It was repeatedly praised for bringing a gay character to mainstream American television audiences. The series finale of Will and Grace flashed forward so we haven’t been left wondering what happened to the pair, their partners and children – although it wasn’t the happiest of endings! We definitely think Will and Grace’s long estrangement could be retconned, or else explored further in a miniature reunion. It was funny portraying the 70s back in the 90s, and we’d wager Eric, Jackie, Michael, Steven, Donna and Fez would be even more hilarious in the 90s (which is what decade it would be if the show picked up again in 2016). Of course, we also really want to see Ashton Kutcher and Mila Kunis share a screen together again after their recent marriage. The series sort of fizzled out after Topher Grace and Kutcher left in the final series, so we think a reunion might erase those bad memories and restore this excellent show to its former glory. We know that vampire slayers typically have a short life expectancy, but the last season of Buffy saw a lot of the burden shared and left the story open to a return. The story has continued in the form of comic books, so a new series could just pick up from season 10 (the current place of the comics) – or invent a whole new story. We just need some reason for the Scoobies to reunite and protect us all from the world’s evil. With the CGI-skills television producers have nowadays, a new series of Buffy could be scarier and more immersive than ever before – while retaining the character drama and emotion we loved the original series for. We have so much love for the folks at Netflix, who are keeping our childhood alive, one reboot at a time. Earlier this year we learned that the streaming giants would be bringing back Full House, and making Lemony Snicket’s A Series of Unfortunate Events into a brand new TV show, but none of that really compares to this latest revelation. After years of existing purely on the grape vine, a revival of Gilmore Girls is shaping up to become a reality. According to TV Line, creator of the beloved series Amy Sherman-Palladino is apparently negotiating a limited-run series with Netflix. That limited run will consist of 4 x 90 minute movies, which fans hope will wrap up the series once and for all (Sherman-Palladino departed the series before its final season in 2007). And while there’s yet to be any cast announcements, we sincerely hope that original players Lauren Graham, Alexis Bledel, Scott Patterson and Kelly Bishop will be set to return. The news comes just two weeks after Gilmore Girls celebrated the 15th anniversary of its series premiere back in 2000. This is making us feel old! While we await news of further developments with baited breath, let’s relive some of Season 1’s funniest moments.